Sink faucets are kind of weird. Hear us out: all toilets work the same way, right? You push the handle, the toilet flushes. The end. But that’s not the case with faucets. Instead, it seems like every faucet works a little differently. Chances are, even the faucets in your own house don’t all work the same way. Usually, this isn’t really a problem. After all, as long as you know how to use them, it doesn’t really matter how they work. When you have a problem, however, the idiosyncrasies of your faucet start to become a concern. There are four main types of faucet, and they all work–and break–differently. Before you can even start considering how to fix your faucet, you have to know what kind you’re looking at. Here are the four kinds of faucet you could find in your home, and how they work. 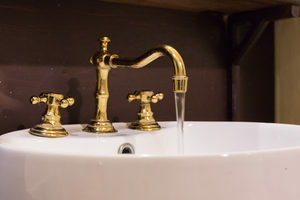 Compression faucets are the oldest of the four types. 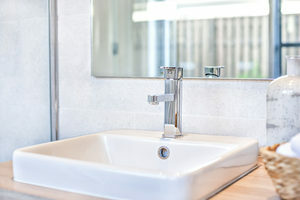 All compression faucets have separate, turnable handles for hot and cold water. You tighten and untighten these handles manually by rotating them to let water flow out of the faucet. Untightening the faucet handle starts the water, and tightening it again stops the water. Using these handles probably feels a lot like turning a screw–because it basically is! Compression faucet handles connect to two stem assemblies (one for each handle). Stem assemblies are essentially screws with washers at the end. These assemblies sit over the faucet’s valve seat, which is where water flows into the faucet. When you close the faucet, you’re driving the stem assembly down to the valve seat. When it reaches the valve seat, the stem’s washer compresses over the valve seat and cuts off water flow. When you open the faucet again, the washer rises and allows the water to flow again. Ball faucets were designed to be the first washerless faucet. Unlike compression faucets, a ball faucet only has one handle for both hot and cold water. They’re especially common in kitchen sinks. If your faucet’s handle can rotate semi-freely up and down and form side-to-side, then it’s probably a ball faucet. The temperature, pressure, and flow rate of the water all depends on where you position the ball faucet handle. A ball faucet’s handle controls a rotating ball called the lever ball assembly. The lever ball assembly is located inside the faucet’s body. The assembly sits on a system of springs and inlets directly over the opening where water through the faucet. This ball has chambers and slots built into it. These slots align with hot and cold inlet seats inside the body of the faucet itself. By maneuvering the ball, you’re aligning the slots in the ball with the inlet seats in the faucet and controlling how water flows through the faucet. Disc faucets are much more recent design that either compression or ball faucets. Like ball faucets, they were designed not to rely on washers. Disc faucets are also considerably more durable than either compression or ball faucets. A disc faucet’s body is much wider than other types of faucets, and they’re usually cylindrical. Disc faucet handles move up-and-down and side-to-side like ball faucets, but they usually don’t have as much free motion. The large, cylindrical body of the faucet contains two ceramic discs: an upper disc and one lower disc. The upper disc rotates with the handle, while the lower disc stays locked in place. These two highly-polished discs are both perfectly flat, so when they’re pressed together they form a watertight seal. When you open the faucet to let water flow, the upper disc separates from the lower disk. Water passes through the newly-created gap until you close the faucet again. Unlike the other types of faucet on this list, cartridge faucets can have either one or two handles. Unlike compression faucets, however, you don’t have to rotate the faucet handles to control water flow. Instead, you can simply turn a cartridge faucet handle to start the water flow. Unless there’s something wrong, the handle should rotate from “off” to “on” in one smooth, easy motion. Single-handle cartridge faucets move up-and-down to control water flow and side-to-side to control temperature, like disc faucets. Cartridge faucets contain a hollow metal cartridge inside the body of the faucet. This hollow cartridge seals the faucet, blocking water flow from both hot and cold water lines. When you open the faucet, you push the cartridge forward. In its forward position, the cartridge no longer covers the water lines, so water flows through the faucet. When adjusting temperature, you’re rotating the cartridge slightly so that it blocks either the cold or hot water intakes. 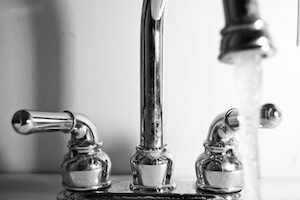 Understanding your faucets is a great first step to figuring out how to fix them. Once you’ve identified yours, you’ll know how to start learning how to fix it. Different faucet repairs require different tools, so don’t start buying repair equipment before you do your research! If you need a little help repairing your faucet–or any other plumbing fixture–give Mike Diamond a call any time. 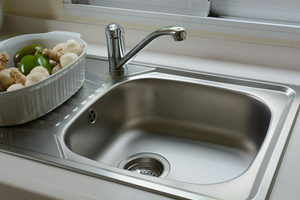 We’ve got plenty of experience fixing pretty much every kind of sink faucet you could imagine. Whether it’s compression, ball, disc, cartridge, or some strange fifth variety, we’ll make sure it’s working right.